BMW, Porsche present 450 kW FastCharge prototype - 100 km range in three minutes, 15 mins for full charge! Home » Cars » BMW, Porsche present 450 kW FastCharge prototype – 100 km range in three minutes, 15 mins for full charge! 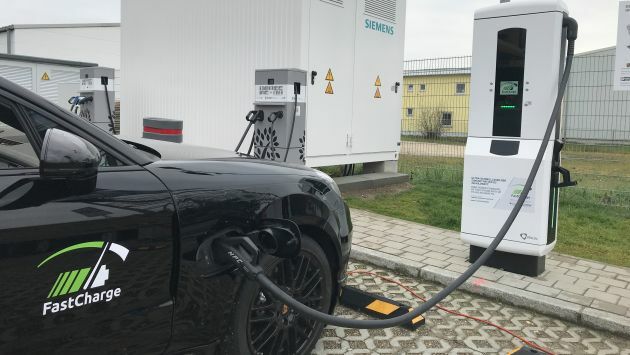 BMW, Porsche present 450 kW FastCharge prototype – 100 km range in three minutes, 15 mins for full charge! BMW Group has revealed that its FastCharge charging station prototype is now capable of providing an unprecedented ultra-fast charging capacity of 450 kW. 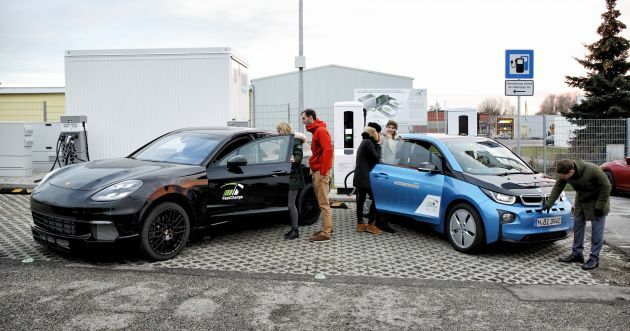 The ultra-fast DC charging station – located in Jettingen-Scheppach, Bavaria – is said to provide a range of 100 kilometres in under three minutes, or 15 minutes for a full charge (10-80% State of Charge). This was demonstrated via a BMW i3 research vehicle, one that’s fitted with a specially-developed 57 kWh 400-volt battery. Together with an intelligent charging logic (which includes precise temperature management before and during the charging operation), a single 10-80% SOC charge only took 15 minutes. Similarly, the Porsche research vehicle with a net battery capacity of approximately 90 kWh achieved a charging capacity of more than 400 kW, thereby allowing charging times of less than three minutes for the first 100 km of range. The charging process works via a multi-voltage network on the vehicle side using a high-voltage DC/DC (HV-DC/DC) converter, transforming the required 800 V input voltage of the charging station to the lower 400 V system voltage of the BMW i3 research vehicle. The HV-DC/DC system also gives the vehicle reverse compatibility, allowing it to be charged at both old and future charging stations. Researchers are currently investigating the interoperability of this system (a key factor in ensuring reliable operation is secure communication between car and charging system), and have submitted proposals to standardisation bodies. FastCharge can be used free of charge right away and is suitable for electric cars with the Type 2 Combined Charging System (CCS) interface, which is commonly used in Europe. The project is led by BMW Group, with other participating industry members including Allego, Phoenix Contact E-Mobility, Porsche and Siemens. Now, the energy supply system provided by Siemens can already handle up to 920 volts, which is the level anticipated in future electrically-powered vehicles. The system integrates both the high-power electronics for the charging connections, as well as the communication interface to the electric vehicles. This charge controller ensures the output is automatically adapted so that different electric cars can be charged using a single infrastructure. The system’s flexible, modular architecture permits several vehicles to be charged at the same time, and the high-current, high-voltage system is suitable for many different applications, including fleet charging solutions and quick charging along highways (goodbye range anxiety!). Linking the energy supply system to the public power grid in Jettingen-Scheppach requires a charging container with two charging connections: one provides a charging capacity of 450 kW, while the second delivers up to 175 kW. Of course, both are available and free to use for all CCS-compatible cars. Of course, the byproduct of fast-charging is heat. For cooling, the High Power Charging (HPC) cables made by Phoenix Contact (fully CCS-compatible) are used, complete with an environmentally-friendly cooling fluid made from water and glycol. This allows the cooling circuit to be half-open, making maintenance comparatively straightforward compared to hermetically sealed systems that use oil as a coolant. The cables also feature specially developed wall duct and tension relief system to prevent the internal cooling hoses from being squeezed, as would usually happen with a conventional cable gland. 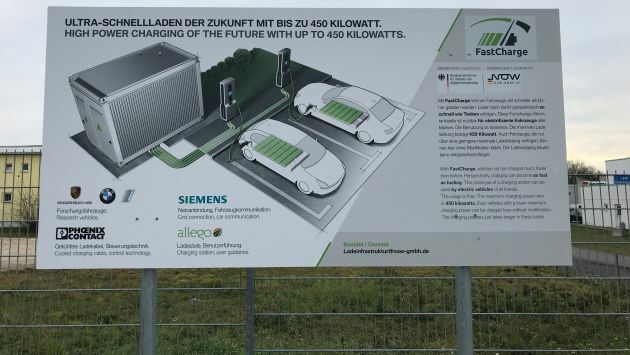 Depending on the model, the new ultra-fast charging station (by Allego) is suitable for vehicles fitted with both 400 volt and 800 volt battery systems. Charge capacity is said to adapt automatically, and is subject to the maximum permitted charging capacity on the vehicle. Comparatively, BMW Group’s FastCharge system is nearly four times quicker than Tesla’s 120 kW Supercharger system, and improves on GM’s 400 kW Extreme Fast Charger (XFC) system. The latter is a solid-state transformer-based system that offers 96.5% grid-to-car efficiency and 290 km of range with 10 minutes of charge time. However, GM says XFC will only be deployed in 20 electric cars by 2023. Terboekkk.. Hope the car can do JB-PG 800km drive with single full charge here.